The Floating Library is an experimental public art project by Sarah Peters that explores the underused amenity of the urban lake as a civic and creative place. The tool in this endeavor is a library. 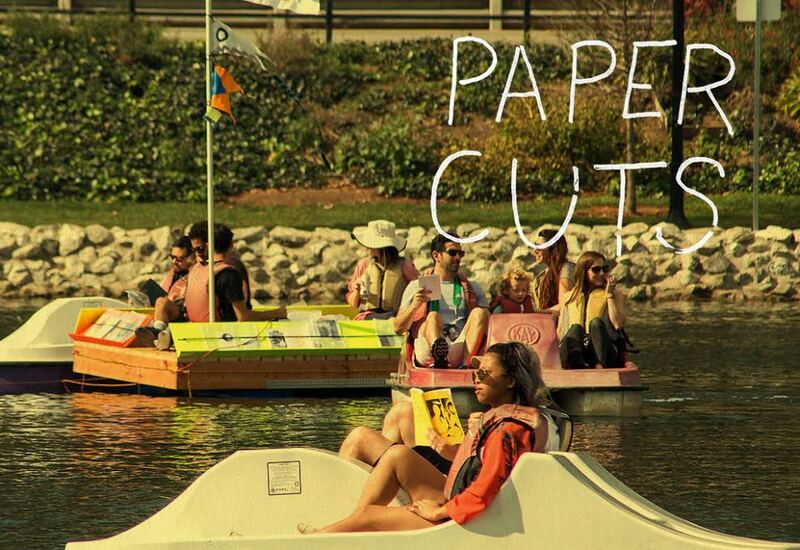 Specifically, a collection of artist books and printed matter aboard a raft reachable by boat. The library has both circulating and reference collections contributed by artists nationwide and internationally. A staff of friendly floating librarians facilitate the check out process and make reading suggestions. Dispensing paper goods on a lake may seem like a juxtaposition of two things that don’t go well together (books + water). This project draws on the common past time of beach reading and the inventive thinking of artists working with the form of the book to provide context appropriate and uncommon reading material to people who are already gathered on the water. Sarah Peters, an artist, writer and art administrator who is interested in public engagement with the arts and critical issues of our time. On the streets she organizes public art events such as the annual Northern Spark festival; in the studio she makes books; on the water she rows a handmade boat and dreams of turning the lakes of Minneapolis into a creative commons.